The Wool Pillow Top is Stage 2 in our 3 Stage “Grow with Me” system for kids who’ve reached 65 lbs. or more. It is made using our American Dream® Wool grown in America’s heartland and carded in a 4th generation woman-owned woolen mill. Natural American Dream® Wool is processed using only natural detergents and conditioners. This topper is covered in 100% GOTS Certified Organic Cotton made in the USA. This plush topper is the perfect addition to our Little Lamb Kids’ Mattresses. The Latex Topper is Stage 3 in our 3 Stage “Grow with Me” system for kids who’ve reached 85 lbs. or more. This topper is the perfect layer for pre-teens and teens’ growing bodies. 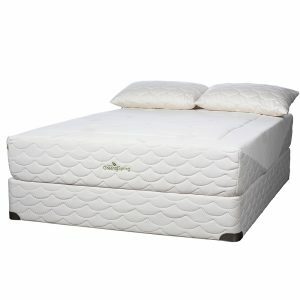 It offers pressure point relieving support and fits in between the wool topper and mattress. It is covered in the same Little Lamb GOTS certified organic cotton and quilted with American Dream™ Wool. We use only Soft 100% Botanical Dunlop latex for the 2″ latex core. A Mattress for Herniated Discs. Firm Support and a Soft Top.